During the Easter holidays, myself and my Hubby were invited to spend the night at Eynsham Hall in Oxfordshire, the most beautiful hotel and wedding venue I have ever been privileged to stay in. I was invited to see the Hall and everything that it has to offer for a couple planning to their wedding and why it would be a wonderful location for a wedding. 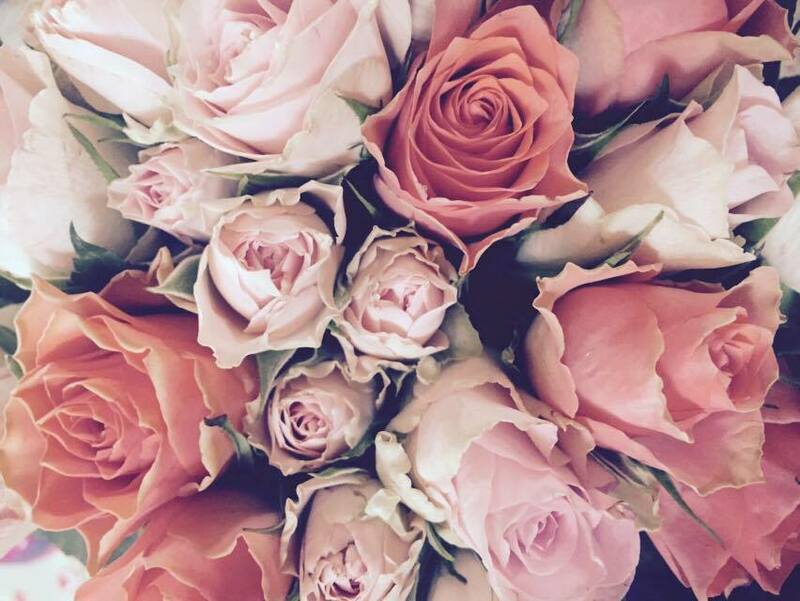 Which it is, absolutely wonderful, but not only is it the perfect venue for a wedding it’s also the perfect location for a romantic getaway I thought I would share our experience of the hotel and the food as well. Eynsham Hall is a grade 2 listed building that was once home to the police training head quarters, from 1946 until 1981 when it was taken over to become a hotel. The current owners father was a police recruit who trained there. 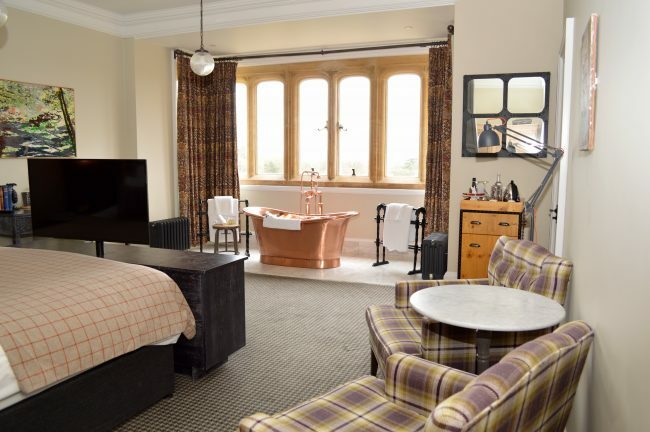 The current owners have redesigned and renovated Eynsham Hall into a stylish boutique style hotel. As it was the training head quarters for the police service for many years, during the interior design process they have incorporated ‘copper’ elements throughout the Hall. There is a collection of police memorabilia in the lounge area, a collection of police hats lining one of the hall ways, but my favourite is the copper bar in the brasserie. Throughout the hotel there are little nods to the police forces who trained there, even the door numbers have copper stitching, perfectly co-ordinated that unless you were aware of Eynsham Hall’s history you would just think the interior design team were brilliant…….. which honestly they were! After I had met with the wedding co-ordinator and had a tour of the venue we decided to have a drink in the Gun Room bar. Which, I had visions of it being full of guns and animal taxidermy however this was not the case. The Gun Room was in fact an interior style award winning bar, from it’s dark panelled walls, orche sofas, chairs of geometric patterns, zebra print rugs and a bar made from copper pipes and full of bottles to make the perfect cocktails, or in our case a pot of tea and a coffee. Before checking in. After our drink in the bar we headed to check in, we had visited a few of the rooms in the main hall during out tour, each one unique in style, however all coordinating beautifully. So, I was excited to see what our looked like. We were given the room cards for room 35, after a walk through the hotel and up the old stair case we arrived at our room. Wow, the honeymoon suite. I was not expecting the honeymoon suite, but was so pleased to be spending the night there. 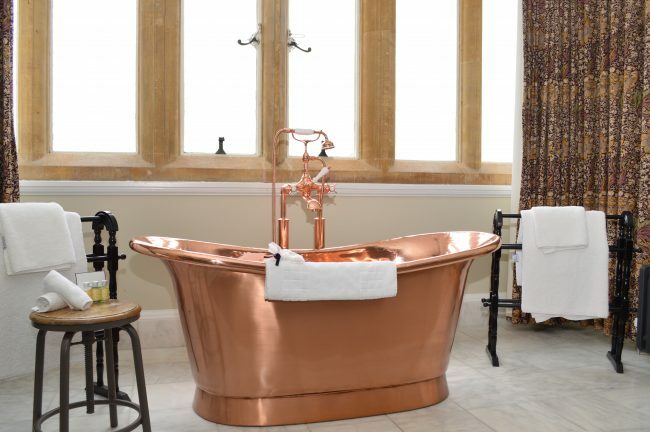 I was amazed to see a fabulous copper bath sat in the bay window, that looked out over the beautiful gardens designed by Owen Jones in 1862 and across the fields. It really was quite a pleasant surprise. The honeymoon suite was large as you could imagine, perfect for spending your wedding night in. There was a mini bar, tea and coffee making facilities. My Hubby was most impressed with there being a cafetiere for his morning coffee, plus it came as bag of cafetiere coffee, that saves the mess of loose coffee, something neither or us had seen before. The large bed, with tv in at the bottom, was really comfy. 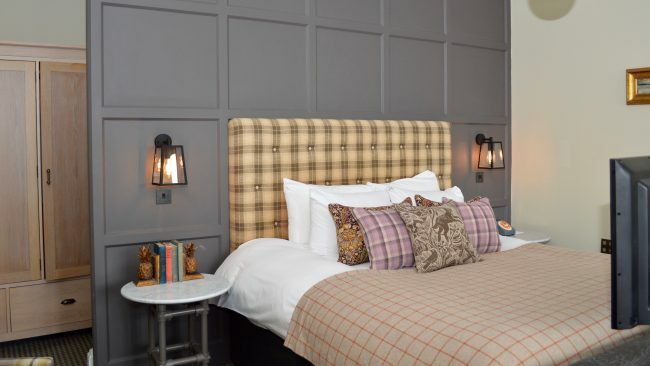 I loved the checked throw over the bed, it was very me. I do love a bit of check and tweed. A large desk with a nice big mirror, plus a DAB radio that was playing as we entered the room. It was really welcoming to go into a room with a light on and some music playing. Lots of little extra touches that makes Eynsham Hall every bit as wonderful as it looks. The arm chairs prodived a nice place to sit a read my book for a hour along with a nice cup of tea and a biscuit while my Hubby went to sleep, he wasn’t well for the whole of our trip so it could have been alot more romantic. Neither the less I was able to relax reading for a hour. The ensuite was a good size, with a double shower, well it was probably bigger than a double. A marble sink and the WC. I fell in love with the floor and wall tiles, which I will now be having in our bathroom when we get our forever home. The bathroom had a nice collection of soaps and shampoos, but there was also plenty of fluffy white towels and dressing gowns. By the copper bath they was again some pretty toiletries for us to be able to use. After a couple of hours of relaxation it was time to head down to the brasserie restaurant for dinner. Although the brasserie restaurant is not a large place, it’s really well set out. With quirky little accessories placed around and lime green chandeliers hanging from the ceiling, which sounds completely out of place in this stately home, however they work perfectly well. Arriving in the restaurant we were shown to our table, and they kindly gave us a couple of different options for tables. We chose I our table, ordered a drink each and looked through the menu. It’s not often we both choose the same food from a menu, but this time we did. 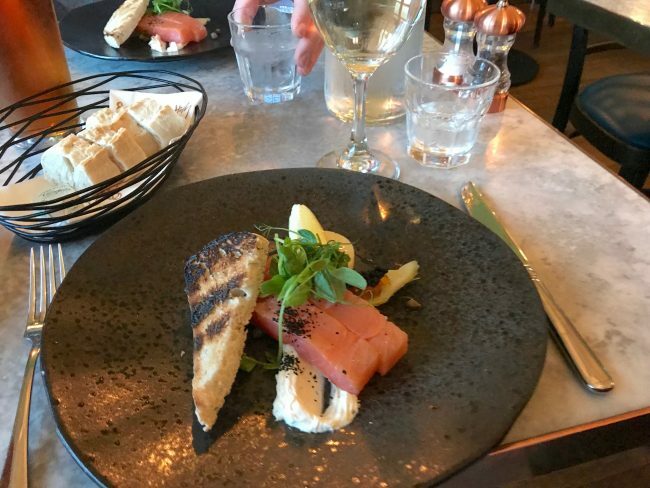 We both choose the Seven and Wye smoked salmon, horseradish cream, rye bread starter. It arrived with some lovely pieces of the most delicious smoked salmon, I’m not a big horseradish fan but it worked beautiful along side the smoked salmon and the rye bread. 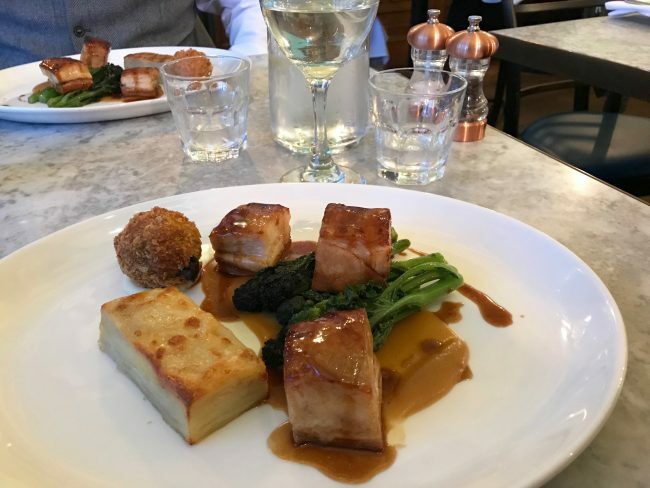 For our main course we both choose the belly pork, dauphinoise potatoes with black pudding bonbon and vegetables. To be honest I have no idea why I chose this, I don’t really eat belly pork and I never eat black pudding. However, I really enjoyed the pork with the vegetables and I did try a tiny bit of the black pudding bonbon, but I didn’t like it. My Hubby however loved it and really enjoyed the whole dish. 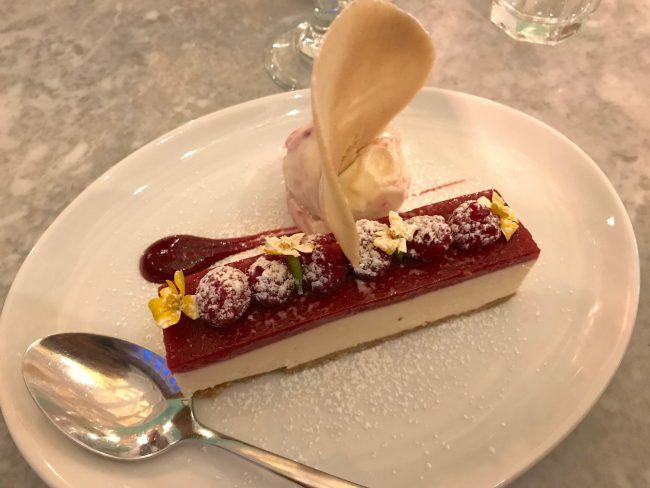 It was only me for pudding, as I went for a raspberry and white chocolate cheese cake with a wafer tuile and raspberry ice cream it was fabulous and so pretty and tasted amazing. I do love a pudding and I would order the same one again. After we returned to our room from dinner, my Hubby got straight into bed and was asleep before I could even take my make up off. He really wasn’t very well. So I ran myself a hot bubble bath, it was to good to miss taking a dip in that gorgeous copper bath. I set up my laptop next to it and watched a couple of episodes of the Crown while enjoying a bottle of Prosecco. The next morning, after a fabulous nights sleep by me, not so much the Hubby who woke to take pain killers a couple of times, we headed down for breakfast. A very good breakfast it was too. There was a buffet of the traditional English breakfast times to help yourself too, plus cereal, pastries and then you could order some items from the menu as well. We both went for a mini English breakfast followed by fruit and yogurt. Breakfast was very good, my Hubby was impressed with the coffee, he is a bit picky when it comes to coffee, so it must have been good. Check out was vey straight forward, hand in the room key, let them know if you have had anything from the mini bar, pay your bar bill and head home, well actually to Bicester Village for a bit of shopping. Not only is Eynsham Hall the perfect wedding venue, it is also the perfect place to have a romantic get away. They also offer dog friendly rooms, which so some people is great. Not sure that my dogs would be coming along for the stay but I have friends who are always looking for dog friendly hotels. Thank you Eynsham Hall for having us along to stay for the night., we had a wonderful time and look forward to visiting again in the future.